Many lovely shades of pink! "Mary is a girl who loves to dream. In fact, she loves to dream so much she can spend an entire day dreaming. One day, when she falls asleep, she finds herself in a nostalgic place very different from her other dreams. Everyone there knows her and treats her like an old friend, and they invite her to play with them or help them. When she finishes all of their tasks, she is invited deeper into the dream." The sequel, Blue Dreams, was scheduled for release in 2017 . Abhorrent Admirer: Boaris to Mary, although that's just because he's a boar, a Seldom-Seen Species for such a fluffy game. 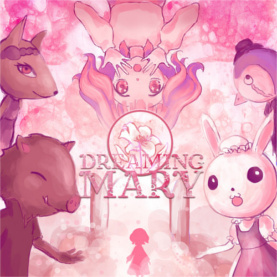 All Just a Dream: The premise of the game: Mary is exploring her dream world. But Thou Must! : You have to give a petal to Boaris in order to get the last seed, in comparison to everyone else who take your petal only if you fail their final challenges. Cunning Like a Fox: Foxanne looks more mature than Bunnilda. High-Class Glass: Penn Guindel, combined with a top hat and a tail-coat. Well, he is a penguin. Lonely Rich Kid: One of the Radio Nightnight broadcasts explains that Mary feels lonely, which may be the reason she created the dream world in the first place. Multiple Endings: There are some extras if you go through the tree door with three petals. Permanently Missable Content: There is a secret room, but you have to discover it before you exit the house. Otherwise, it will stay shut. Punny Name: Every animal friend - Bunnilda, Penn Guindel, Foxanne, and Boaris. Reality Warper: The radio implies that Mary's mother could make her dreams come true in reality. Mary could have inherited the ability, but still can't use it. Red Oni, Blue Oni: Downplayed. Bunnilda is aloof and romantic; Foxanne is mature and confident. Boaris looks more of a "hands on" guy, while Penn Guindell is an acculturated reader. Ridiculously Cute Critter: Bunnilda the maid, and, to an extent, the rest of Mary's animal friends as well. Sugar Bowl: Really, most of the game is PINK.